Sanjana Rao – Lekha Ink, Corp.
Sanjana Rao was born in 1994, and has always had a passion for communication with other people, especially children. In addition to her love for youth and children, she has also always enjoyed studying health and the human body, especially with regard to illnesses such as Diabetes. When her younger brother was diagnosed with Type 1 Diabetes, she felt the need to create a bridge between her two greatest passions and write Comida Deliciosa y Saludable: Barriga Feliz!, an interactive and educational book for children about Diabetes prevention through good nutrition. Currently, there are two versions of the book, one in English and the other in Spanish. 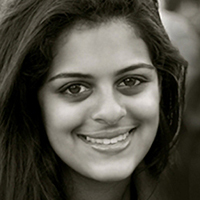 Sanjana has a great interest in Latin-American culture and has studied Spanish for many years. When she is not writing, Sanjana also likes to sing, cook, and practice photography. She currently attends Castilleja School in Palo Alto, California and lives with her parents and her brother in the San Francisco Bay Area. She plans to attend medical school and become a pediatrician. Comida Deliciosa y Saludable: Barriga Feliz!